Do you remember when I said I "frequent" this little store called The Neighborhood Thrift Store? Remember I got my new used kitchen tables and chairs there? Well, yeah this is from there too, but...I've had this for several months. I have been waiting and waiting on spring and warmer weather so I could do some spray painting and this weekend I did (FINALLY) Don't you think this is actually a great looking table with it's two tone color scheme, it really is a nice table. It has a nice maple top with forest green legs, can you say 90's? Not that there's anything wrong with that.....love the 90's and 80's. 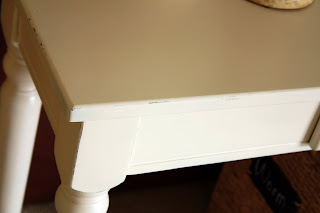 I started with a light sanding, mainly on the top of the table to rough up the surface because it helps the paint adhere better. Then I cleaned off the dust/dirt to make sure I had a clean surface for painting. Decided I probably should use some primer since the wood was darker and I didn't want the wood grain to show through the paint. I'm glad I did use primer this time. distressed, right? By the way, it's HARD to take sand paper to a newly painted surface that I worked so hard on, but I did a little bit. Should I distress it more? It looks so nice with our brown leather furniture and really helps to lighten up the space. We don't have any problems with natural light, but all of our furniture is dark so I was ready to lighten it up a bit. I love how it turned out and can't wait to try my hand at something else! Andrea, Love it! Looks so fresh and bright in the living room! I love distressed furniture but after you put all the hard work into painting it sometimes it's nice to just let is sit all nice and pretty before you rough it up. I love it, Andrea! I'm a big fan of Heirloom White, myself. I think it looks good the way it is. I love how you've decorated the top and the basket underneath. visiting from tutorials and tips linky. 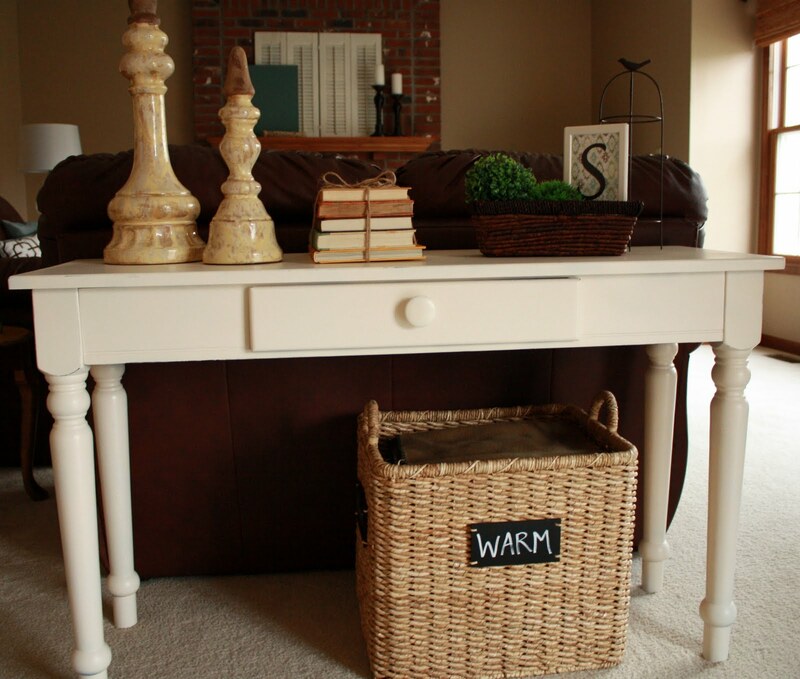 Your sofa table looks awesome, Andrea! I love the power of paint! I really like the way you have styled the top of the table (especially the books tied with twine) and underneath the table. I think the table looks super as is. In my house furniture tends to get distressed looking all on their own! Thanks for linking this up to our blog party! I need to find a table like that at a thrift store or something; those tables "new" are just too expensive! Great job. I really like it! I have a tv stand I want to spray paint, but have never done it before and was wondering if I should paint paint. I think after saying this, I will go for the spray paint! It's really great the way it is, but if you are going for that kind of chippy, vintage look, then you probably need to distress it a little more. So cute! 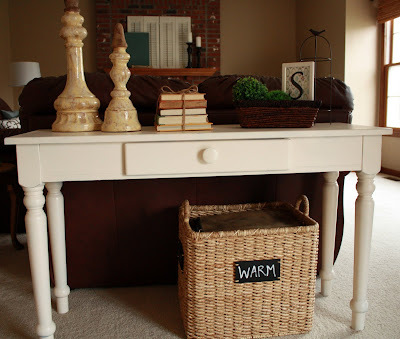 I've been wanting a little sofa table and this one looks so doable for me! Now a new follower and excited to see what you do next! Check out my blog I'm a newbie too! Hi Andrea, found you at Debbie's. Table came out great and I love the color. Just telling my hubby that everything is the family room is so dark and needs to be lightened up a bit. I'm your newest follower and I hope you will follow me back. Beautiful job! Did you brush, spray or roll on the paint? What a nice job you did! Thanks so much for joining my newbie party. Looks great!! I found your blog through debbie doo's I am your newest follower. I'd love for you to follow me also. Hi Andrea! 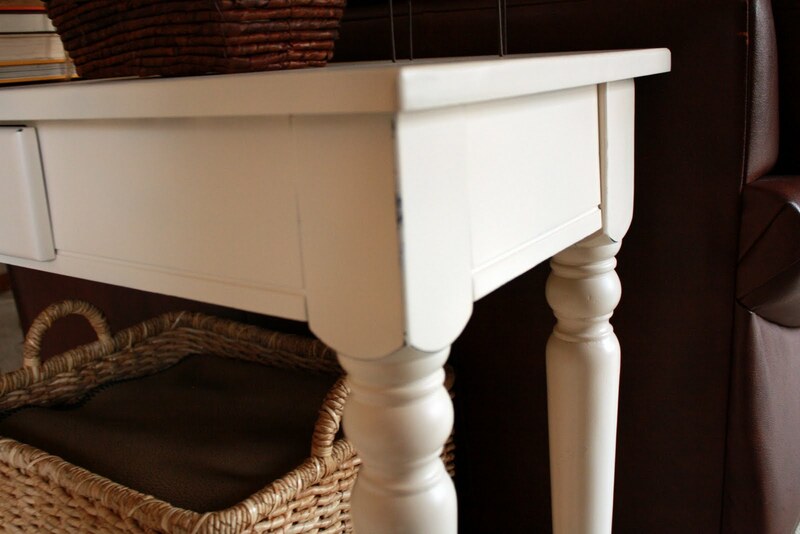 Your sofa table looks great! I had the same problem with spray paint last weekend. I think it has to do with the wait time between coats. The directions on mine said do a second coat within one hour or 48 hours. Since I did my second coat about 5 hours later, I blamed this for that weird texture problem. Who knows if that's it though! Leather furniture can add elegance and luxury to almost any room, and these pieces are also designed to be fully functional. Leather recliners are not only popular for its classic and elegant style, but also its comfortable and supportive design. You can find best recliners from the comprehensive best recliner reviews guide. Recliners make our home beautiful it also useful for our health. Because we can find many type best recliner brand. This recliners are more comfortable then normal wooden furniture.